In a couple of weeks my wife Judy and I will be traveling to Germany for a time of relaxation, study, and visits with German friends. I will be writing about those events as they occur. But as we get closer to going I began to reflect on our visit to Germany last year. At the end of that visit while visiting our friends Gottfried and Hannelore I took a trip with Gottfried to the T4 Euthanasia Center memorial at Hadamar which is about 12 miles from where they live. Hadamar had been a mental hospital for decades before it was chosen as one of six places where an euthanasia program ordered by Hitler was to be conducted. Hitler ordered the program on September 1st 1939, the same day his forces invaded Poland. Between 1941 and 1945 over 15,000 people, deemed to be “life unworthy of life” were murdered at Hadamar. The victims were killed in a bus garage where they were killed with carbon monoxide gas, the gas chamber, or by lethal injection or intentional overdoses of barbiturates while laying in bed at night. The gas chambers at Hadamar ceased operations at the end of 1941 and were removed, making the killings in the next stages “up close and personal” killings done by medical professionals. The specialists that operated them were transferred to run the death camps in German occupied Poland. 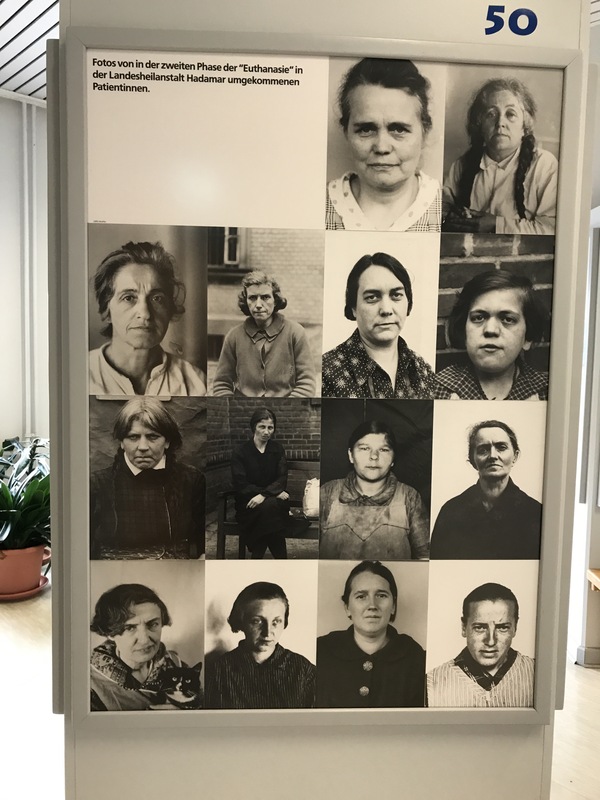 Those killed at Hadamar included men, women, and children deemed to have diseases, handicaps, or mental illnesses that kept them from being a useful part of the German economy, or a drain on society. Likewise, there were many people brought to Hadamar to be sterilized so they could never reproduce. The orders for this action came from Hitler himself and were based on what were in the early 20th Century very popular expressions of Social Darwinism which were not isolated to Germany. Sadly, there were those who expressed the same thoughts and conducted medical experiments and sterilization short of euthanasia in many Western countries, including the United States. The victims included the handicapped, the mentally ill, those born with Down’s Syndrome or other neurological diseases, Jews, people with long term illnesses, children, people determined to be asocial, and during the war soldiers, including those of the Waffen SS who were determined to have mental illness, including what we would now call PTSD which made them unfit for active service. The relatives of those killed received notification from the authorities that their son, daughter, sister, or brother had died of natural causes, certified by the doctors who had decided that they should die. Unlike the extermination camps in the East, or the concentration camps, the killing in Hadamar and the other T4 centers was conducted by medical personnel. Most of the up close and personal killing using lethal injection or barbiturates were conducted by nurses under the direction of physicians. When the first phase, that which used carbon monoxide gas in the bus garage was ended, many of the personnel involved were transferred to help run the extermination camps including Treblinka, Soribor, and Auschwitz in the east. Their service at Hadamar was little more than a training ground for their future employment. I will write more about the T4 Program and Hadamar at another time. That being said I have to admit that the visit was chilling. In addition to being a memorial, with historical classes, seminars, and tours being offered, the campus is used for many other activities, including medical and educational programs. Likewise, unlike places like Dachau, which are not particularly scenic locations, Hadamar, located in rural Hessen is a place that one could never imagine mass murder ever have taken place. It is a beautiful and peaceful location, so the crimes that happened there, although numerically small compared to other camps are unimaginable. Afterwards Gottfried and I talked and went back to his house. I went on a walk to the town hall, or the Rathaus to see the towns memorial to the Jews who lived there before the war and then I took a walk in the surrounding area and went back to the Jewish cemetery which I had visited last night as the grave stones could not be read in the dark. Those which were still legible were written in Hebrew and or German and most dated to the 1800s and early 1900s. 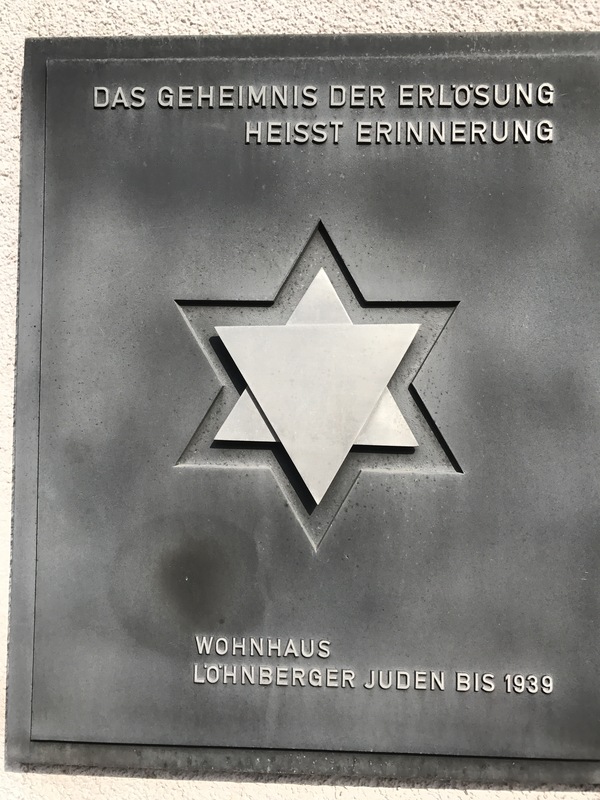 As I mentioned last night the Jews who remained in Loehnberg were forced to sell their houses and belongings and were sent to the extermination centers. At least one survived and she helped dedicate the memorial at the Rathaus in 1991. One thing that I do like about Germany is that the majority of the people now have the opinion that the crimes of their parents, grandparents, or even great-grandparents generations need to be remembered, and the victims, and not the perpetrators be honored. I wish it was that way in the United States where we honor too many of the men who brought genocide to the Native American tribes, or enslaved African Americans and considered both the be less than human. 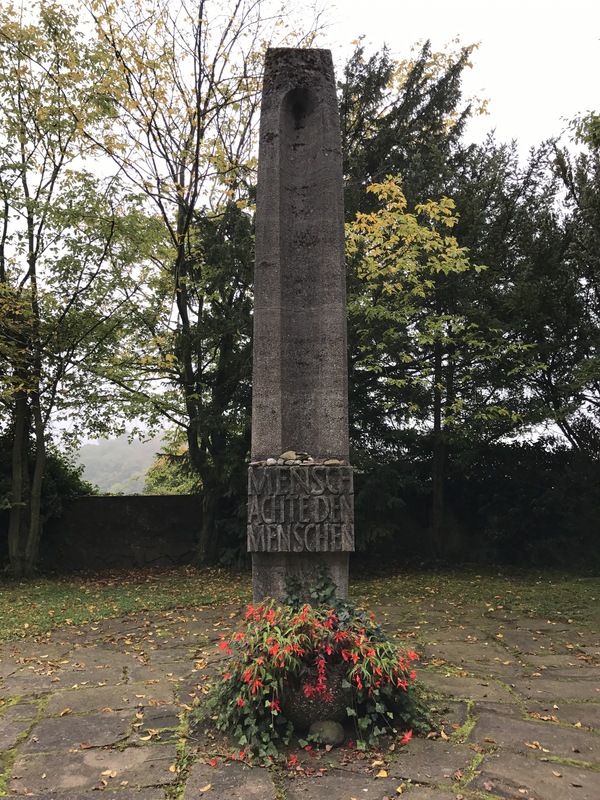 As I walked through the forests and meadows surrounding Loehnberg after my visit to Hadamar, as well as my visits to Dachau, the White Rose Memorial and museum at the University of Munich, and the National Socialist Documentation Center in Munich I did a lot of thinking. I wondered about people who could excuse such terrible crimes in the name of love of country, or even worse because they really believed that God thought that their country and race mattered more than others. I began to think about Manifest Destiny and American Exceptionalism in the light of what happened in Germany, a people who believed for close to 80 years that God intended them to dominate Europe and even the world. Many of theological writings of the times in Germany and the United States. Honestly, I think that there are a lot of people in the United States who call themselves “Pro Life” because they are anti-abortion or against birth control that would have no problem with the methods of the Nazis at Hadamar so long as those methods either brought them a profit, political power, or were used against people that they thought were less than human. Since lot of these people, mostly self-identified Evangelical and Catholic Christians frequently are in lockstep with President Trump, and cheer him on as he identifies those that he believes to be less than human or unworthy of existence in the United States, I have no doubt that they would either approve and justify such actions or turn their backs on the victims. When I ponder than it sends a cold chill down my spine, because they are our neighbors, co-workers, and we rub shoulders with them every day. Your last little paragraph says it all. Another “Padre Steve” post, and considering the direction the “great” religions and politics of this world, a timely reminder to all and sundry to pay attention. Yes, the Earthian species is well known to ignore real danger until after it has fallen in the trap it has unconsciously or consciously been constructing for itself, but perhaps this time, with access to so much information, it could avoid, not the pitfall itself, but putting the final touches on the pitfall. Personally I think it’s too late for that but I’m a perennial pessimistic optimist so you can’t take my word for it. Instead, take current events and do some tough mathematical deductions, like 2+2 and see if it comes up with something other than 4. Reason, logic, common sense, are we still capable of some of that? Padre Steve, show us some of our very recent history now. The best way to express how much I appreciate your post is to reblog and say thank you. In my late years I have deduced that as long as we steadfastly refuse to take on life from a purely compassionate stance, no matter what we do, however well-meant, will boomerang against us. Beware the ones who talk not in polemics but in a seemingly cool, rational way, as if this is the most obvious and understandable thing to do, for The Common Good. Beware above all the stage when they start ‘to make sense’…. there are those who are very good at that.